103 Easy Cookie Recipes is the fourth in a series of RecipeLion cookbooks. RecipeLion is part of Prime Publishing LLC, a lifestyle multi-platform brand focused on cooking and crafting content. The Prime group receives over 68 million monthly page views, and over 7.9 million readers subscribe to Prime’s family of email newsletters. 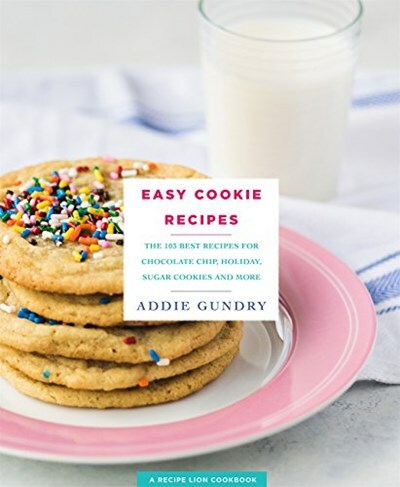 In the fourth RecipeLion cookbook, Cutthroat Kitchen winner Addie Gundry whips up 103 easy cookie and bar recipes from classic cookies like peanut butter and chocolate chip to holiday and spice cookies and even more adventurous types. In this book Addie adds elegance to no-frills baking with delicious results.